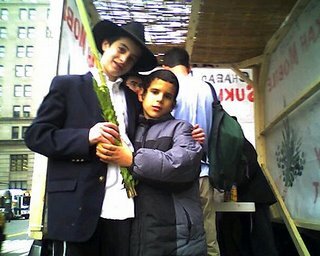 During the seven days of the festival, Jews are commanded to dwell in sukkot. Since few live in climates that allow them to sleep outside in October, most fulfill the requirement to “dwell” in a sukkah by eating all their meals there. Generally, building the sukkah is a family project; once the structure is in place, the kids help decorate it with fruits and flowers of the season including dried squash, stalks of corn, bunches of grapes, painted pumpkins and branches laden with berries. 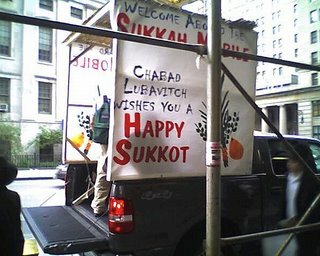 Another commandment involving Sukkot features what are known as the Four Species: a citron (known in Hebrew as etrog), a palm branch, two willow branches and three myrtle branches. The branches are bound together and called a “lulav.” The observant face East, hold the lulav and etrog, recite a blessing, then wave them East, South, West, North, up and down. 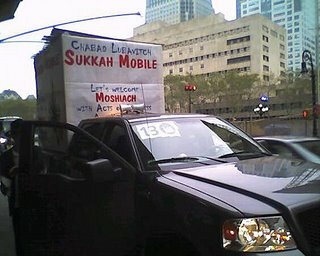 For those who can’t dwell in a sukkah, or shake the lulav and esrog on their own, the Chabad Lubavith has set up a mobile sukkah and it driving it through the streets of Brooklyn. Today it was parked downtown, near Borough Hall. The curious and the pious were welcomed into the wooden hut on the back of a truck, where volunteers placed the Four Species in their hands. If the visitors didn’t know the proper blessing, they were prompted and if they didn’t know what to do with the Four Species, they were shown. If you have only two pennies left in the world, with the first penny, you should buy rice to feed your family. With the second penny, say the wise Japanese, you should buy a lily. The Japanese understand the importance of dreaming. It was rush hour. 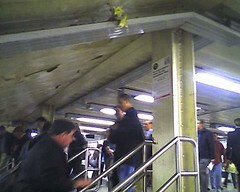 I was sprinting through the Times Square subway station, running down a short flight of stairs, when something bright caught my eye. 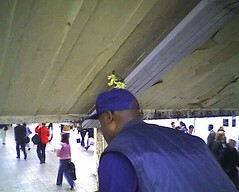 It was a flower — a stem of yellow lilies — stuck into some metal duct-work at the ceiling. There, against the dirty, peeling paint, was a small, cheerful beacon, a sweet surprise and a reminder of spring and beauty and hope. I paused for a moment, fired off a couple of shots with my cell phone, and kept going. 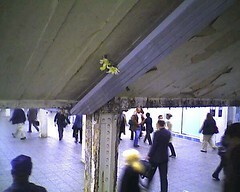 There was no time to linger, but I couldn’t resist turning around for a final, blurry photo of the lily underground. Then I ran for my train. 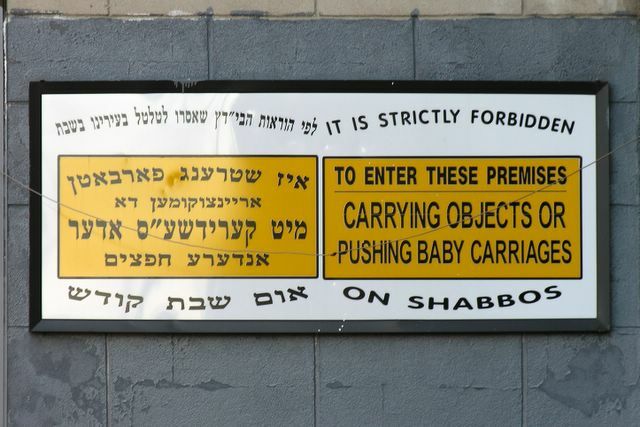 You are currently browsing the Blather From Brooklyn blog archives for October, 2005.